1. Is it important to know your farm and farmer? Imagine this: it is the end of the day, around 5 pm, and you rush from work through the busy streets and traffic to your farm. You step out of the car, and time already feels different as you slow down. You pull a few bags out of the car and walk over to the long tables stacked high with vegetables. You say hi to a friend. Your farmer says hi, calls you by name.You ask them about the odd spaceship like vegetable you've never seen before, and they tell you about kohlrabi and give you some cooking ideas. You can smell the rich soil, the growing things. You select that week's fresh produce, and grab some scissors to cut a few flowers out of the field. 20 minutes later, you feel calm and collected and ready for another week of CSA abundance. It is a powerful thing, coming to the farm once a week to be among the growing things, to sink your teeth into a carrot, to pick your own flowers, to have that moment of zen offered just off some of the busiest streets of Missoula. But it does require an investment of time, and that's not for everyone. If that sequence didn't make you want to pull your hair out, you should think about us. If coming to the farm each week between 4:30 and 6:30 pm feels like it will make you crazy, it probably will. The pay off has to be worth it for you. One of the most common struggles from new CSA members is that the pick up window isn't long enough. We want to see you. We believe in the power of green growing things, in a sense of place. Our CSA members state in our surveys that they love coming to the farm and often list a favorite thing about their farmer: Greg's laugh, Josh's vision, Dave's ease and friendliness, Samantha always calling them by name. If you don't mind the extra trip, and you want to feel a part of the farm's community, have the chance to pick your own produce out, the chance to ask about what it is and how to cook, this is a good place for you. 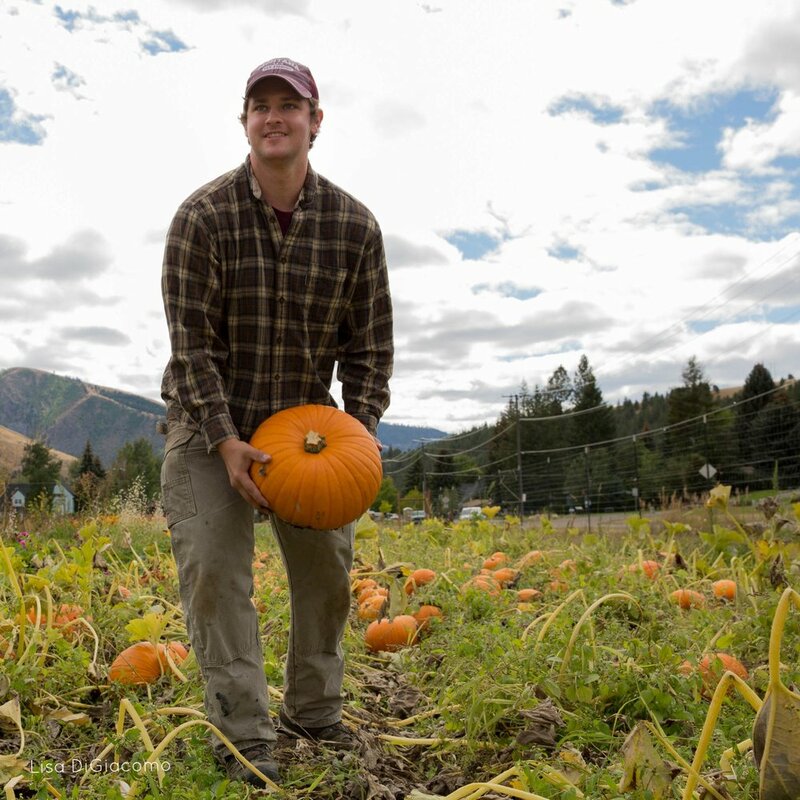 Our farms are dotted in four convenient spots around Missoula. So, while it is a special trip, it is still in town. If you believe in supporting your farmer directly, as well as supporting an organization essential to the fabric of Missoula, that's another reason to join. Garden City Harvest's food and programming reaches over 20,000 people -- that's almost a third of Missoula! Your support is part of the critical earned income that keeps Garden City Harvest in operation building community through food. "After seeing the River Road garden and hearing your mission, it was easy to know I wanted to be a part of Garden City Harvest." This also means that you are with our farms come drought or high water. You are a shareholder, and that means you will benefit from a flush tomato year. But if there's a freak hailstorm in this middle of August, you might not get as much corn. "We love the community aspect." Guide you -- in-person, via our blog, and emails-- in your CSA cooking and eating journey each week. Share in the story of the food we are growing and eating together. You tell me your story and we will tell you ours. 2. Do you love fresh, gorgeous food? Do you taste the lackluster flavor in zucchini, cauliflower, or tomatoes that have traveled a long ways to your plate? Our member surveys tell us that one of the most important things about our food is that it is high quality and great tasting. This is one of the highlights they name in their surveys year after year. We offer a lot of food, and as much variety as our climate allows. We grow heirlooms and a diversity of varieties, we save seed, we hand-weed, we know our plants. We also harvest veggies for your CSA that very same day, at their height of their freshness. This means quality product. If food quality is a top priority for you, then you have another great reason to try us out. 3. Is it fun to try new foods? Everyday. All summer. To the left is kohlrabi: one of my favorite odd veggies. We'll help you learn how to incorporate this into your favorite dishes (I put it in fajitas -- delicious!) And, we'll give you tips to make sure whatever you make with kohlrabi doesn't have the texture of freshly peeled tree bark! You will get veggies you love and veggies you just plain don't. Many varieties of veggies will be included in your weekly share. Kohlrabi, salad turnips, bok choy, a crazy amount of greens in the beginning of the season, and an abundance of root veggies and winter squash at the end. These are all part of eating seasonally. This is different than how many of us have ever cooked before. Here's the thing: we will give you new veggies to try. We won't leave you hanging on what to do with them. The Real Dirt will be there week by week to help you out, and so will our farmers who've been cooking seasonally for years. They love to tell you about their favorite recipes. We also love to hear from you -- share your recipes with us online with The Real Dirt or directly with our farmers. One of our customers said that her favorite part of the CSA was: "Picking up a load of fresh food every week and figuring out what to do with it." 4. Are you a control freak when it comes to meal planning? Know yourself. If you want green salads every week, if you must have shepherd's pie with cauliflower topping and there is no cauliflower in your box that week, will it ruin everything? Our biggest complaints each year is that a member didn't get enough of one thing, and got too much of something else. But some members love the structure it lends: "It is an excellent source of healthy, consistent, local vegetables. After being a member for several years, it is routine and a great way for my family to meal plan and cook healthy foods." Our CSA members are somewhat spontaneous with their food planning. That might mean doing meal planning on a Monday (or Thursday night), after you get your CSA box. That might mean modifying a recipe for a few less of one veggie and a few more of another. That might mean getting creative when you get two ears of corn (and your corn loving family is made up of four people) and cutting the kernels into a salad instead of serving on the cob. That also might mean tuning into The Real Dirt, where we will post your veggies and ideas for what to do with them. 5. Do you have some patience to learn to eat seasonally? We've got the tools, do you have the drive? It's like Iron Chef right in your kitchen. Are you ready for the challenge? It might mean that you had a late work meeting, you're starving, and get take out on the way home because, well, reality. Or the kids have a swimming meet over a weekend and, "Ain't no way you're bringing a cooler full of veggies." And so, the veggies molder in the fridge. That, dear friends, is why we have compost piles. The reality is that it takes several seasons to learn to eat nimbly. To triage the quick to rot veggies, know your family's eating habits and what you might want to store in the freezer for the long haul vs. eat right away. Finding your food routine. Again, we're here to help. We'll give you guidance. But you have to be willing to go on this journey with us. And be okay with a few rotten bags of veggies. There's no guilt here! If you want join a CSA to support Garden City Harvest, but decide a CSA share is not for you, might we suggest making a donation? If you love what we do, you'll make just as big an impact by supporting us in that way. Donors are huge supporters, too. We would love to welcome you to one of our four farms this summer, to be part of what we feel is a warm family. We'll teach each other. We'll share a collective food story: one of growing, one of eating and breaking bread (or maybe zucchini?) together around the table.